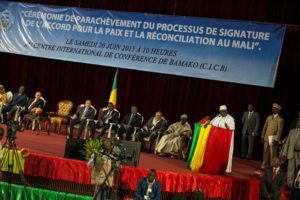 A senior United Nations official Wednesday urged Malian parties to implement 2015 peace agreement, insisting that it is time to move from promises to actions. While Malians must ensure the successful holding of elections this year, their priority should be the implementation of the 2015 peace agreement, Mahamat Saleh Annadif, Special Representative of the Secretary-General and Head of the UN Multidimensional Integrated Stabilization Mission in Mali (MINUSMA), said at a briefing before the Security Council. “The peace process is complex, but it is time to move from promises to action to meet agreed deadlines,” he said, adding that advancing the peace process and holding the elections must go hand in hand. He noted that the entire political class agreed that elections must take place on time, with the utmost transparency and credibility. Just as the 2013 elections re-established constitutional order in Mali, those in 2018 must irreversibly anchor democracy, he insisted. Presidential elections are scheduled for 29 July and 12 August, and legislative elections in November and December. In terms of preparations, he said, an agreement is in place to revise the electoral law and an order has been placed for eight million voter’s cards. In line with its mandate, MINUSMA has started to lend technical and logistical support, including the distribution of election materials and deployment of electoral personnel, while also preparing for any potential violence. The Special Representative said the Security Council must call upon the Malian political class to respect the adopted timetable and encourage them along the path to consensual, peaceful and credible elections. The security situation has deteriorated, particularly in the center of Mali, he said, noting that an independent expert recently voiced concerns about serious human rights violations in the country. With the UN country team, MINUSMA has launched an initiative to promote the restoration of State authority in central Mali, as well as economic growth and the provision of social services. Emphasizing that a purely security approach is not enough, he said the Mission is continuing to support the specialist judicial system tackling terrorism, money-laundering and cross-border crime. He emphasized the need for the training of peacekeeping troops, adding that the Mission remained about 100 armored vehicles short. Troop- and police-contributing countries have been asked to do what they could to fill the equipment gap. Canada’s offer of six helicopters, while welcome, fell short of what is needed. Turning to the ongoing strategic review of MINUSMA, he said the Mission is awaiting the Secretary-General’s recommendations with the hope that ensuing discussions will lead to a better alignment between its mandate and the realities on the ground. Posted by Khalid Al Mouahidi on April 12, 2018. Filed under News. You can follow any responses to this entry through the RSS 2.0. Both comments and pings are currently closed.